Nov. 8, 2017 3:00 p.m.
There’s dogs who cuddle with cats and even ducks who hatch chicks, but an even more bizarre animal friendship has been fostered at a Lower Mainland home. 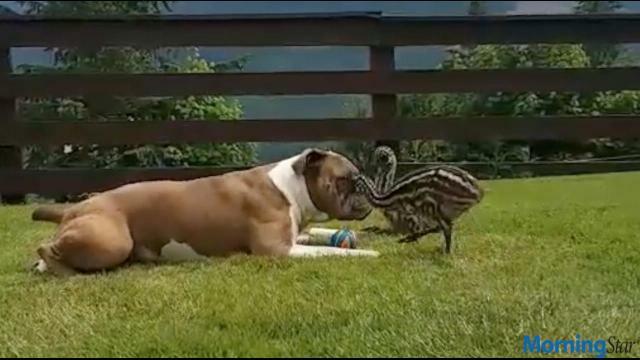 Magnus, an Olde English bulldog, has a special bond with his feathered friend Gizmo – a five-month-old Emu. “They are best buds they have grown up since the emu was a chick,” said owner Jenna McRae. “The emu gets so excited when Magnus comes around. They basically beg to play with each other. Gizmo is one of three emus at the Mission, B.C., farm – and are McRae’s favourite pets. Their playful nature and unique personalities have even helped McRae through a tough period of grief. “I got the chicks when my brother died, they were the only thing that brightened my day,” she said, adding that they continue to make her smile on difficult days. While some people think McRae is a little crazy for having pet emus, which she takes for walks with her dog, she wouldn’t have it any other way. “They are such a great addition to the farm,” said McRae, who is expecting her own bundle of joy in a week. She’s hoping she can divide her attention between her feathered, fur and human babies, as the emus don’t do great with kids. But there are plans for more in the works – more baby emus anyway, which McRae’s boyfriend has grown to love despite his initial hesitation. “At first when we got the adult emus Fred was like oh wow I gotta get these stupid birds to keep her happy,” laughed McRae. “Now he loves them so much. I told him we can only get two more next spring because he wanted six more.